Blue announces its first planar magnetic headphones | What Hi-Fi? Blue's Ella headphones are the cheapest of their kind to feature planar magnetic technology. The company has also announced a $400 pair called Sadie, which has the same redesigned headband. Planar-magnetic headphones use very thin, flat electrical conductors to create sound, rather than a moving diaphram. As such, they're expensive, and not made often. Nevertheless, Blue has brought out its own pair of $700 planar-magnetic cans, called 'Ella' (pictured). They have another interesting feature - an in-built 250mW amplifier that can be toggled between 'On', 'Off', and 'On+'. The On+ mode gives the amp a slight boost at 63Hz, which apparently is "just right for restoring the low-end character of music mastered in the era of vinyl". The battery that powers the built-in amp lasts for about 12 hours, and charges fully in a quarter of that time. When you take off the headphones, they automatically power down - although the battery doesn't need to be charged for the headphones to work. 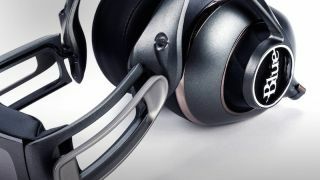 Alongside Ella is another pair of headphones called Sadie which, as with Blue's other headphones, offers a built-in amp and custom-tuned 50mm dynamic drivers. Sadie is considerably cheaper than Ella, coming in at $400. Blue has redesigned the headband for both headphones, using a four-point multi-jointed design that, it says, is "inspired by the finely tuned suspension of Formula One racecars" to provide a better seal around your ears. It's clear that Blue is trying to bring more advanced tech to the public at a cheaper price - the Ella headphones are around £100 cheaper than their rival planar-magnetic Audese EL-8 cans - but advanced technology is no guarantee of better sound quality. We shall reserve judgement until we have heard them ourselves.